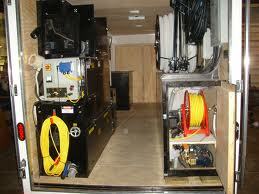 When insulation has been fire damaged, water damaged, or heavily infested with rodents removal is recommended. 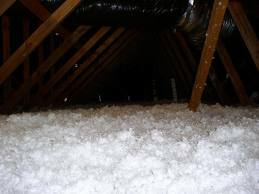 We hand-remove the fiberglass rolls and pack them in bags that are carefully removed from your attic. 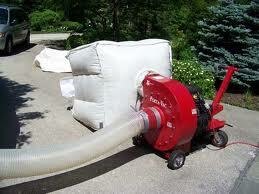 If the attic has blown material, we use a large vacuum machine to remove all the material. The vacuum is outside the house and this creates a "negative pressure" in the attic such that air is being drawn up into the attic, this ensures a clean job where little or no debris enters the home. Vacuuming and removal is a very labor-intensive and time-consuming task. We generally need a whole week's notice to get to a job and it may take 1-2 days to complete. We charge by a price per square foot, please call our offices for a quote. 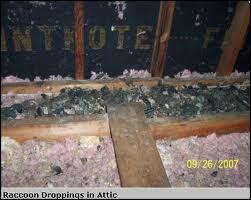 Most insulation removal is based on raccoon, possum, or rodent infestations. Because there are usually just a few areas affected, we often recommend "Spot Removal", which very simply means we remove the insulation and debris around the various areas where the rodents were. 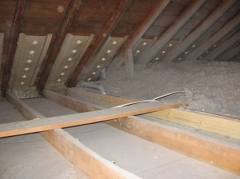 We remove the infested areas and generally add more insulation to bring the entire attic up to R-38 or more.